It might have been Kiss who reinvented the spectacle of a stadium show in the seventies, but Def Leppard took things to new heights in the late eighties with their 'In The Round' performances – and they still know how to put on a great show now. I remember seeing them reduced to playing in small theatres in the early noughties, so it's absolutely brilliant to see them back in the arenas where they belong. 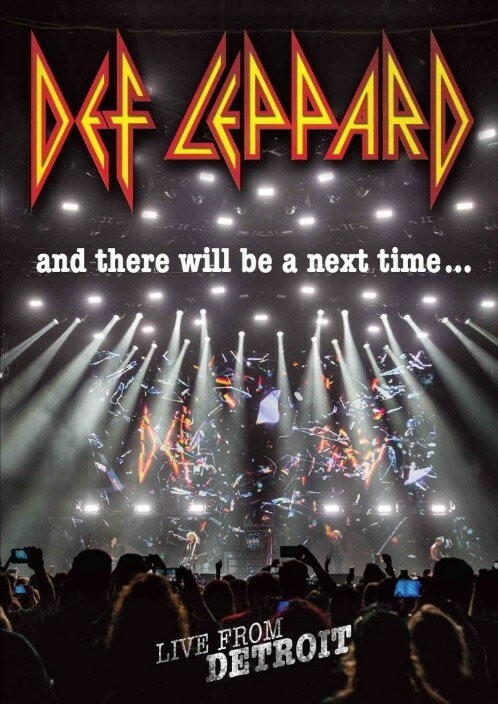 Four years after the 'Viva Hysteria' DVD comes 'And There Will Be A Next Time...' (the title taken from Joe Elliott's regular concert farewell "until next time... and there will..."), filmed last year while promoting 2015's well-received 'Def Leppard' album. It's a beautifully filmed, multi-camera angle, ninety minute performance with plenty of long-distance views that show the stream of images displayed on the enormous video wall at the rear of the stage that enhances the spectacle of a Leppard show, from the exploding glass cover of the latest album that brings the show to life to excerpts from promo videos and montages of vintage photographs. The band themselves, however, don't rely on the backdrop to provide the entertainment, as all are very vivacious throughout, in particular Vivian Campbell who is showing absolutely no signs of his recent ill-health. The show demonstrates just how formidable his guitar partnership with Phil Collen has become, while also supplying a healthy portion of the amazing backing vocals, which are such an integral part of the Def Leppard sound. Though there is very little between-song banter from Elliott, he is in fine voice throughout. There are three songs performed from the '...Leppard' album, 'Let's Go', 'Dangerous' and 'Man Enough', all slipping comfortably into the set alongside the classics, although it's surprising that their cover of David Essex's 'Rock On' is also resident, along with three from the 'High 'N' Dry' album, namely 'Bringin' On The Heartbreak', 'Switch 625' and an awesome 'Let It Go'. Elsewhere, the 'Hysteria' and 'Pyromania' regulars are all present and correct, no matter how many times you hear these songs you just never tire of them. Needless to say, the sound quality is amazing. Although the recent promo videos are included, the real reason to buy this DVD is to see an amazing band who have endured their fair share of tragedy but are still more than capable of delivering the goods.